New York and Boston enter the homestretch facing the possibiity of another postseason showdown, this time with a slew of young stars who are giving the rivalry new life. The previous renewal of the greatest rivalry in sports began on a November night in Nicaragua over whiskey, Cuban cigars and millions of dollars. It was Thanksgiving weekend, 2002. The Red Sox, having just finished their first season under new ownership, decided they had tired of the Yankees kicking sand in their faces. Their brand spanking new general manager, 28-year-old Theo Epstein, flew to Nicaragua to sign free agent Jose Contreras, a sturdy Cuban pitcher so steeped in mystique he answered to the nickname El Titan de Bronze, an homage to a heroic 19th-century general from that country. Under the advice of international scouting director Louis Elijaua, Epstein bought up all 12 rooms at the hotel closest to where Contreras was training so that no other team could get near the pitcher. The nearest hotel was miles away. The Red Sox at last had outflanked the mighty Yankees, which is how Epstein and Elijaua came to be sharing drinks and smokes with Contreras and his agent with nary a New York official in sight. Contreras would be theirs for $23 million over three years. The next day Epstein returned to Contreras’ room to officially seal the deal. That’s when he saw two shadowy figures moving in and out of the room. They were with the Yankees, dispatched there with one assignment from owner George Steinbrenner: Come back with Contreras, or you’re fired. They offered $32 million to sign Contreras and keep their jobs. A bit later, Contreras asked to see Epstein. He was crying. Boston lost to New York. Dog bites man. Ho hum. But this was different. The rivalry was elevated that night because the Red Sox, with owner John Henry’s money and Epstein’s brains, made the decision that they would spit in the Yankees’ eye. They would be a worthy challenger. Their history dated back to the beginning of the 20th century, and the two teams had finished first and second in the AL East for five straight years (with the Yankees on top each time) and squared off in the 1999 ALCS. But over the next nine years (2003 to '11), Boston and New York took their rivalry to new heights. They again finished 1–2 and were separated by no more than eight games in eight of those nine years. They both reached the postseason in five of those years, and at least one made it every season. Each team won at least 89 games in 17 of those combined 18 seasons. They met in two epic, seven-game ALCS clashes, in 2003 and '04. The rivalry was the single greatest additive to the fueling of the greatest economic growth baseball had ever seen. After that 2011 season, however, the rivalry grew dormant. Epstein left to take over the Cubs, and though the Red Sox won the 2013 World Series, they also finished in last place in the AL East in '12, '14 and '15. The Yankees, increasingly saddled with expensive, declining veterans, were swept in the 2012 ALCS and averaged a pedestrian 85 wins over the next four years, with a wild-card game loss in '15 their only postseason appearance. Most notably, perhaps, the two teams haven’t finished within eight wins of one another in six years. This year, however, the rivalry is back. The teams enter a weekend series at Fenway Park battling for a division title with five weeks to play, and the Nicaragua moment of these times might have come last Sunday night thanks to a swing by a 20-year-old kid known as Baby Face. 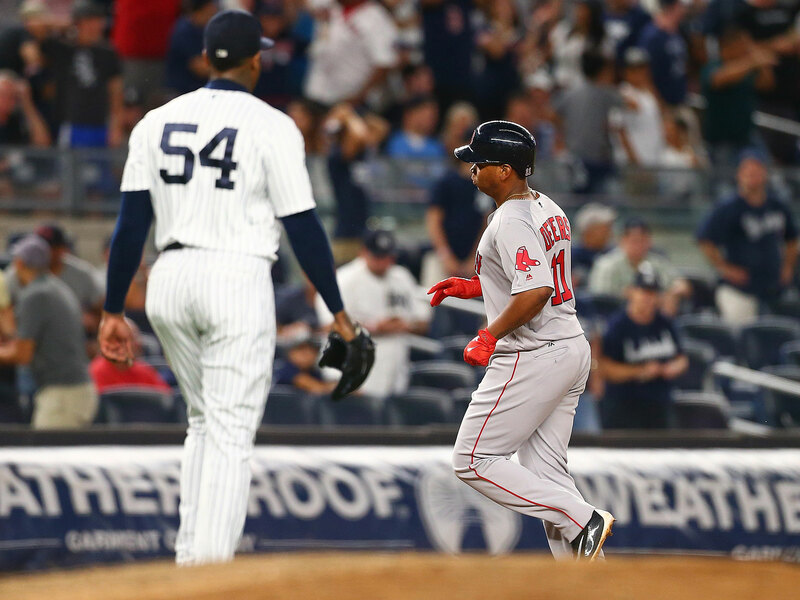 In the ninth inning at Yankee Stadium, Rafael Devers, playing in just his 14th big league game, stepped in to bat against the hardest throwing man on the planet, New York closer Aroldis Chapman, with Boston trailing, 2–1, and down to its last two outs. Chapman had just blown away Hanley Ramirez with three straight fastballs, as thoroughly and powerfully as a pitcher can dismiss a professional hitter, with a stunned Ramirez looking back at Chapman as if contemplating hiring a lawyer for damages. The next pitch, also 102 mph, was not to the young artisan’s liking. He let it pass for a ball. The next one, still raging at the same speed, tested his calculations. He fouled it back, bringing a small grimace to his cherub face, knowing he was just a smidgen away from squaring it up. The fourth one, at precisely 102.8 mph, was the one that will live for as long as people talk Yankees and Red Sox with the hyphen in between. At the moment it left his hand, Chapman had faced 301 lefthanded hitters with two strikes in his career and never allowed a home run. He had faced 387 straight lefthanded hitters regardless of count without allowing a homer. He had not allowed a home run on any of his last 646 pitches that were clocked at 100 mph and above. The kid solved Chapman in four pitches, like one of those geniuses of spatial thinking who solve a Rubik's cube in under a minute. Devers blasted a home run to left-centerfield over the 399-foot sign. Chapman, who former manager Joe Maddon said is built like “wrapped steel,” crumbled in pain and surprise. Devers, with that little kid’s face and chubby body, fairly skipped around the bases as if blasting out of the middle school doors for recess. He is astonishing for such a young hitter. Devers is 6-foot, 195 pounds, and he does not hit with brutal strength, precise fundamentals or an impressive physique. Like Hank Aaron, he hits with the hands of a jeweler and the wrists of a blacksmith. The kid was born to hit. The Red Sox went on to a 3–2 win in 10 innings, and that home run was the moment the rivalry needed. We haven’t reached the final stages yet in the Five Stages of Giving Each Other Grief in a true rivalry (Denial, Pennant Race, Competing for Free Agents, Playoff Series, Actual Dislike), but the home run by Devers at least proved we’re on our way. Here’s why the rivalry is just beginning. Boston used six homegrown position players on Sunday, none older than 27 and all of them under team control through at least 2019: Devers, rightfielder Mookie Betts, leftfielder Andrew Benintendi, shortstop Xander Bogaerts, centerfielder Jackie Bradley Jr., and catcher Christian Vazquez. Pitchers Chris Sale, Rick Porcello and David Price will be right there with them through at least 2019. Across the field, the Yankees had their own core of 27-and-under hitters ready to stick together through at least 2019: leftfielder Aaron Hicks, shortstop Didi Gregorius, rightfielder Aaron Judge and catcher Gary Sanchez, with first baseman Greg Bird, second baseman Starlin Castro and outfielder Clint Frazier all on the disabled list. That’s 14 young position players who aren’t going anywhere for these next three seasons if their clubs want it that way. After taking two of three in the Bronx, the Red Sox headed back to Fenway Park with a 5 1/2-game lead in the AL East. But they immediately gave one back, as the Yankees came back to beat the Mets in New York and the Indians clobbered Red Sox starter Doug Fister for 11 baserunners and five runs in less than five innings in a 7–3 win. It was a reminder of Boston’s warts. It is a great team when either Sale or Drew Pomeranz starts (33–14), but a bad team otherwise (34–37). Price, with his balky elbow and fragile ego, is still playing catch on flat ground and trying to outrun a media firestorm of his own making. Setup relievers Matt Barnes and Addison Reed don’t trust their stuff to challenge hitters in the zone. There is no lefthanded specialist. The Sox are an aggressive but too often reckless team on the bases; they’ve run into 27% more outs on the bases than any other team in baseball. And they don’t have the offensive firepower to run away from the Yankees, who rank second in the AL in runs scored. As the New York series began last Friday, Boston manager John Farrell took inventory of his team, and put his finger on what was needed. While Boston was stumbling behind Fister, the Yankees made their own statement against the Mets, who arrived from across town like an order of chicken soup for the wounded soul. 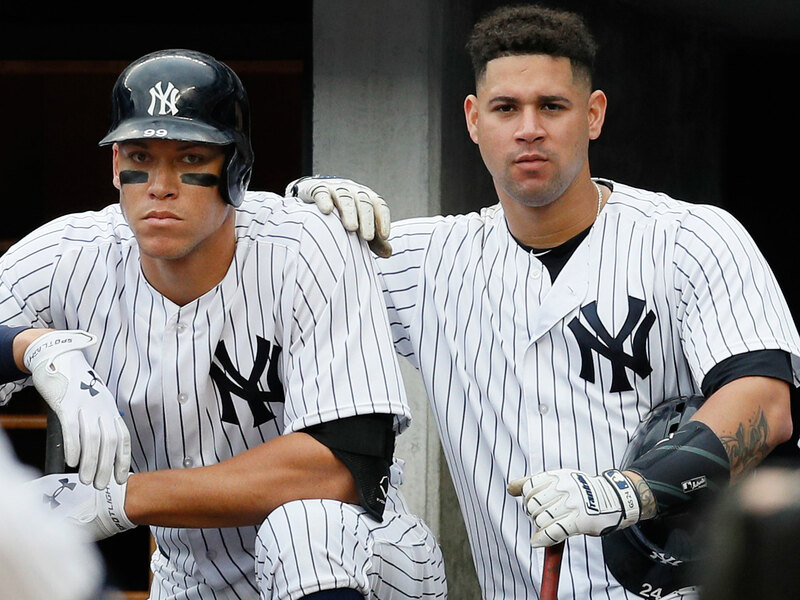 The Yanks immediately felt better after Judge tied the game in the sixth with a home run and Hicks and Sanchez added solo shots in the eighth to power a 4–2 win. New York went on to sweep the four-game Subway Series, with another titanic Judge home run on Wednesday for good measure, and head to Boston four games back in the AL East and four games ahead for a playoff spot. Judge is the biggest key for the Yankees. He has too much swing-and-miss in his game to be consistent right now. He has extreme home/road splits: In his first calendar year in the big leagues, he hit .224/.360/.441 on the road with half as many homers as he hit at Yankee Stadium. But he is a 40-homer guy on mistakes alone, and more still if he maintains the plate discipline he lost after the All-Star break. Judge appears to be a smart hitter and a hard worker, based on the adjustments he made in his first big league offseason (tamping down his leg kick, moving his hands behind him in his stance, raising his back elbow to load, and staying over his back hip longer to generate more power and launch to his swing). Now the improvement he needs must come from repetitions: pitch recognition and patterns. Last Friday, for instance, there were two outs, first base open and the lefty-hitting Gregorius on deck against the lefty Eduardo Rodriguez—an obvious pitch-around situation. Judge got himself out by swinging at four pitches out of the zone. Judge reminds me of Mark McGwire as a rookie. In 1987, McGwire set the rookie record with 49 homers, a number endangered by Judge, who now has 37. McGwire was simply a brute as a hitter. He overpowered the baseball. The point is that we’re talking raw, generational power. If the 6'7" Judge makes pitchers come back into the strike zone, he can find the form he showed in the first half, when he simply played baseball without having to fill a role as ambassador of baseball and quite literally The Next Big Thing. Before the season started, Lee Mazzilli, a Yankees advisor and former big league player, coach and manager, asked Judge about his goals for the season. Mazzilli’s son had played with Judge in the Arizona Fall League. “I just want to be healthy and play,” the humble kid said. It was a window into Judge’s grounded approach. As this new version of the Yankees-Red Sox rivalry starts to percolate—as the best September in this rivalry since 2011 looms—it may have unofficially begun with Devers’ home run, but there is no dislike yet. No Bill Lee getting his shoulder wrenched, no Pedro Martinez taunting Jorge Posada and sending Yankees hitters to the hospital in pairs, no “Who’s Your Daddy?” and “Where Is Roger?” chants from the acerbic Greek choruses that make this rivalry so hot. There will be time for that. For now, the best September in this rivalry in six years awaits. Athens and Sparta collide seven more times—three times this weekend in Fenway, and four times at the Stadium starting two weeks after that. After Sept. 3, they go their separate ways, but always with an eye on one another.